Margus Palolill was born and raised in south-east Estonia, where the culturally distinct, orthodox region of Setomaa is situated. 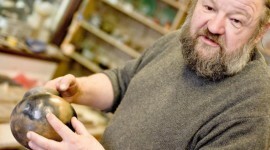 He studied environmental sciences at the University of Tartu and did a master’s degree in Geology. During his studies he took an interest in southern Estonian solid clay buildings and his primary field of research at university was the contents and characteristics of various clay materials used in the traditional, historic, clay buildings of Setomaa. He also collected information about the building styles and architecture of the local clay buildings, contributing thus to the understanding and conservation of this unique but fast disappearing craft. While studying clay buildings, Margus became interested in the craft of Estonian traditional log-building – as the primary material for farm-houses. He started as an apprentice working on shingle roofs and some years later he joined a traditional log-building company, Saulerman, where he learned how traditional handcrafted log-houses are produced industrially – ie. in a fast, efficient and profit-oriented way. Although he was grateful for the experience, he soon realised that there was more he wanted to know about the science of timber and woodcraft than just mastering the production of log-houses. From 2009-2011 he worked for the Räpina School of Horticulture as a log-building teacher to landscape architecture students. 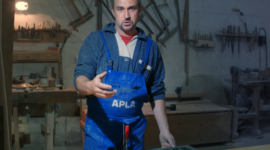 In 2013, he opened up his own carpentry workshop and is currently specialising more on the skills of cabinetmaking. 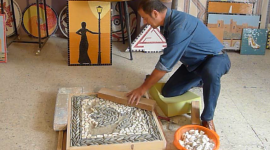 The primary produce from his workshop is wooden doors and windows but he also makes also indoor and outdoor furniture. In 2005, Margus bought an old farmhouse in Setomaa and started to renovate it in a responsible way, so that its historic appearance would be preserved. Estonian vernacular farm architecture is devoid of ornament or decoration and is notably plain and modest with a particular room structure. Retaining the historic appearance and simultaneously adapting it to modern family life was therefore a real challenge. However, Margus believes in taking things slowly and gradually learnt about the history and character of his old house. He even interviewed the former inhabitant of the house in order to gain more information about it. He finally moved in with his family in 2007 and continues the renovation at an equally slow pace still aiming for authenticity. 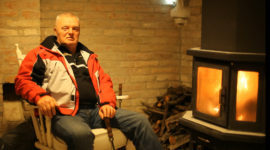 In 2008 he built a traditional smoke-sauna. Drawing from his experiences in traditional log-building, renovation and teaching, he joined Vanaajamaja in 2009 as a log-building instructor and adviser on old wooden houses. Vanaajamaja is an Estonian non-profit organisation that is dedicated to the studying and teaching of traditional building crafts. Margus has been tutoring traditional log-building courses at Vanaajamaja since 2009 and in 2012 he started to teach international log-building courses on Estonian smoke-sauna construction. During the six day workshop, the participants are taught how the log structures were built in the old days with only hand tools. They will learn traditional Estonian log-building by cutting and raising a traditional smoke sauna (in est. suitsusaun), which is a sufficiently small log building but nevertheless an iconic form in Estonian vernacular architecture. Workshop participants will also hear about the historical and cultural context of log-building in Estonia, and about historic buildings and restoration techniques and usually Margus also covers also the importance of the smoke sauna and Estonian sauna culture in general in his courses. Estonians are in general, fond of stressing that their ancestors have lived in their present location for thousands of years. The history of architecture in Estonia starts with cone-shaped tents and stone graves, continues with fortified settlements and unique barn-dwellings, and somewhere in between the smoke-sauna appears, which is a small log-built sauna without a chimney and is common to all Balto-Finnic people, including Latvians-Lithuanians, Finns, Karelians and Estonians. As the social status of Estonian villages did not change much until the 19th century, this type of building endured perhaps for centuries. During the 20th century, smoke saunas in most of Estonia were gradually replaced by Finnish saunas. However, it would appear that southern Estonians have the smoke sauna tradition more deeply rooted in their culture. Saunas of traditional design there have been more resistant to the changes of modern times than in other countries, and historic smoke-saunas are well preserved and popular despite the inconveniences of a longer heating time and greater consumption of firewood. The smoke sauna tradition is an important part of everyday life for most southern Estonian families. It comprises a rich set of traditions including the actual bathing customs, the skills of making bath whisks, of building and repairing saunas, and of smoking meat in the sauna. The building material is usually Scotch pine or Norwegian spruce and most of the traditional joints and notches are covered. Although knowledge about traditional sauna customs is still widely spread, the skills of building the saunas that were also common once, and taught by fathers to sons, have mostly disappeared these days. 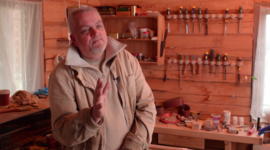 Margus and the rest of the Vanaajamaja team do their best to encourage people to learn how to preserve, restore and build their own log-buildings including smoke saunas.